The University of Georgia has just lost one of the key pieces of its defense, if not its entire team. 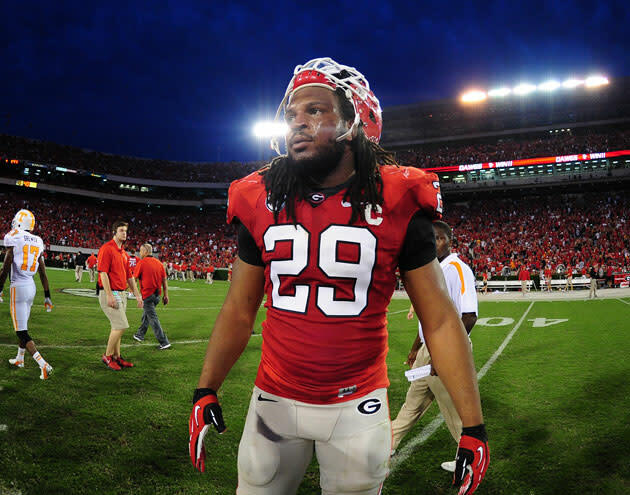 Linebacker Jarvis Jones will declare for the 2013 NFL Draft, according to CBSSports.com. Jones, a junior, was an absolute beast for the Bulldog defense the last two years, leading the SEC in sacks in both 2011 and 2012 even though he missed two games because of injury this season. A graduate of Georgia's Carver High, Jones initially committed to Southern Cal before transferring back to Georgia. A few days ago, Jones set the Bulldogs' new single-season sack record of 14.5 in the Capital One Bowl. He also notched 85 tackles and 24.5 tackles for a loss. Draft scouts project Jones as the top linebacker coming out of school and among the top 10. CBS tabs him as the no. 3 overall prospect, behind Texas A&M offensive tackle Luke Joeckel and Florida State defensive end Bjoern Werner. SB Nation has him going 9th to the New York Jets.